Newly excavated 174-million-year-old fossils in northwest China are a new dinosaur species named Lingwulong shenqi — or "amazing dragon of Lingwu" — that roamed the supercontinent of Pangea, a new study found. The big picture: The study, published this week in Nature Communications, details the oldest diplodocoid — massive sauropod dinosaurs with long necks and tails — ever found. It also pushes back estimates of their evolution by 15 million years. The study raises more questions than it answers, however. 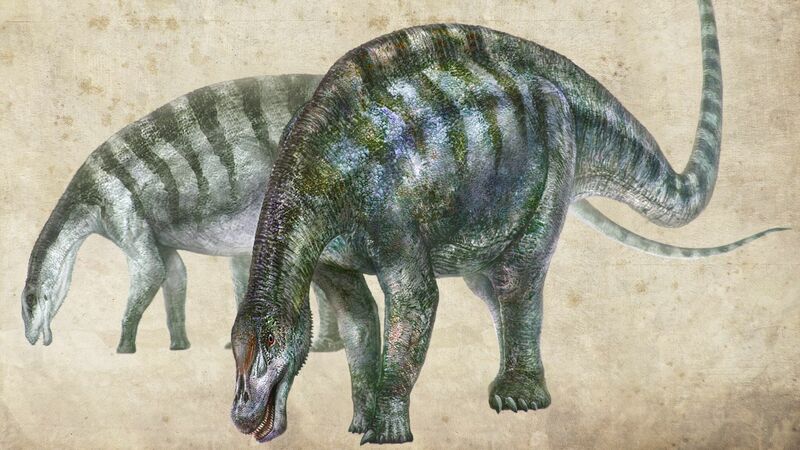 For example, lead researcher Xu Xing said in a statement that these types of dinosaurs "were thought to have never made it to East Asia because this region was cut off from the rest of the world by Jurassic seaways." But the new "amazing dragon" shows that they were present after all, and suggests that "the isolation of East Asia was less profound" than previously thought. According to the study, there were between seven and 10 Linwulong dinosaurs found at the site, and they all died near one another, leading researchers to believe they were herd animals. The longest was about 57 feet long. The study says these dinosaurs likely ate hefty vegetarian diets of conifers and ferns. They had peg-like teeth and may have grazed on lower vegetation in what at the time was a warm and wet environment.